With Europe enlargement, the group felt the need to open to new experiences and other Countries too, in order to get a wider profile. 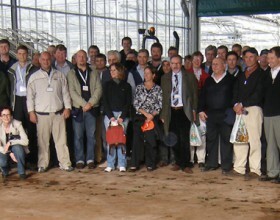 After variuos meetings, culminated in December 2005 in Verona, Italy, personalities representing the English, French, Central East European turfgrass culture got together in the foundation of ETS in Pisa, July 2007. ETS fundamental Authorities are the General Assembly and the Directive Committee (Board). is the supreme Authority of the Association and includes all the members. It takes place at least once a year: during ETS Conferences (that take place every 2 years), or in occasion of other events (every other year). (Board) is the executive authority of the Association ETS. It meets twice a year. It consists from 5 to 9 members elected, including ETS president, ETS secretary and ETS treasurer. Its members are not paid and they serve for 4 years.